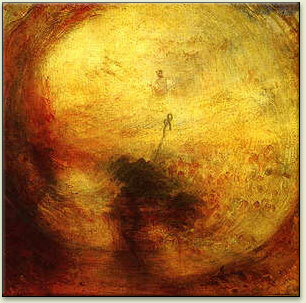 The title of Turner’s painting “Light and Morning after the Deluge, Moses writing the Book of Genesis” (1843) pointedly describes the role of the color yellow: the radiant yellow sun ends a long period of darkness and begins a new pure era of light after the all-devouring deluge. 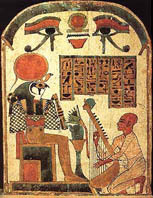 The painting is interpreted as an allegory of light, with Moses depicted slightly above the center in the vortex of light. The word yellow comes from the Old English geolu. Yellow is associated with sunshine, knowledge, and the flourishing of living creatures, but also with autumn and maturity. The yellow sun was one of humanity’s most important symbols and was worshiped as God in many cultures. According to Greek mythology, the sun-god Helios wore a yellow robe and rode in a golden chariot drawn by four fiery horses across the heavenly firmament. The radiant yellow light of the sun personified divine wisdom. In China, yellow is assigned to the active and creative male Yang principle, while ancient Egyptians ascribed yellow to the female principle. In the English language, yellow has traditionally been associated with jaundice and cowardice. In Italy, "yellow" ("giallo") refers to crime stories, both fictional and real. This association began around 1930, when the first published series of crime novels had yellow covers. Yellow is also the color of caution. Yellow lights signal drivers to slow down in anticipation of stopping. Construction scenes and other dangerous area are often enclosed by a bright yellow barricade tape repeating the word "caution." The oldest yellow pigment is yellow ochre, which was amongst the first pigments used by humans. Egyptians and the ancient world made wide use of the mineral orpiment for a more brilliant yellow than yellow ochre. In the Middle Ages, Europeans manufactured lead tin yellow. They later imported Indian yellow and rediscovered the method for the production of Naples yellow, which was used by the Egyptians. Modern chemistry led to the creation of many other yellows, including chrome yellow, cadmium yellow, lemon yellow, and cobalt yellow. Yellow is light with a wavelength of 570–580 nm, as is light with a suitable mixture of somewhat longer and shorter wavelengths. Both the yellow sun and yellow gold shared the qualities of being imperishable, eternal, and indestructible. Thus, anything portrayed as yellow in Egyptian art generally carried this connotation. The skin and bones of the gods were believed to be made of gold. 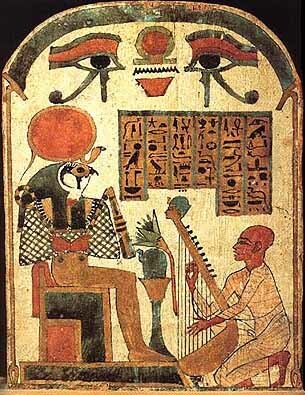 In this image of Ra, note the gold skin tone of the god. Compare this to the musician, who has the classic reddish-brown skin tone of humans. In early 20th century Germany, Franz Marc ignited a back-to-nature movement, a central tenet of which was that animals possessed a certain godliness that men had long since lost. Marc wrote, “People with their lack of piety, especially men, never touched my true feelings.” In contrast, he also wrote that “animals with their virginal sense of life awakened all that was good in me.” Marc developed a theory of color symbolism in order to communicate the ideas of his movement. 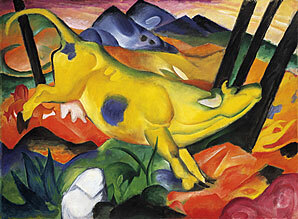 Yellow symbolized femininity because it is “gentle, cheerful, and sensual,” while blue symbolized masculinity because it is “spiritual and intellectual.” The cow in his painting, The Yellow Cow (1911, Solomon R. Guggenheim Museum), could therefore be a depiction of Maria Franck, his wife, while the triangular blue mountains could be Marc’s abstract self-portrait. For over a century, it was believed that the commonly used Indian Yellow pigment was created from the urine of cattle in India that were fed only mango leaves and water. Allegedly, the dried urine was collected and formed into balls of pigment. There is no concrete evidence to suggest that cow urine was the true origin of Indian Yellow pigment. Today, a synthetic Indian Yellow hue is manufactured using a combination of nickel aso, hansa yellow, and quinacridone burnt orange.